A bag building, worker placement strategy game! Orleans is a bag building, worker placement strategy game in a medieval setting. Unlike many worker placement games where all workers are placed on a central board and only one worker can occupy a space, in Orleans each player has their own board and 7 different types of workers to place in a variety of locations. This game does not require players to get to a spot first, it is all about how effectively a player can blend together the right set of workers at the right time to collect more points at game end. Players begin with 4 workers, a farmer a boatman, a craftsman, and a trader. At the start of each turn players draw a number of workers out of their bag. This starts at 4 workers, but can be increased up to 8. Then players assign their workers to spaces on their player boards. All actions require more than 1 worker to be assigned. Each type of worker has specific spaces where they can be used. There are 10 different actions that can be triggered with the right combination of workers. The castle, farm house, village, university and monastery each bring an additional worker of a certain type to be placed in the player’s draw bag. There is a knight, another farmer, boatman, craftsman or trader, a scholar and a monk. The monk is wild and yields no additional action when it is acquired. Each other worker brings with it a move up on a specific track that yields an additional benefit. The farm track gives players goods tiles for game end scoring. The craftsman track gives players a technology token that is used to permanently occupy an action space. The trader track gives the player a building tile that will allow that player an additional action space for the rest of the game. The boatman track gives the player coins that score points at game end. The knight track gives the player the ability to draw additional workers from their bag each round. The scholar track moves a player’s marker up on a development track that will yield coins and a multiplier for points at game end. Half of the main board is occupied by the various tracks. The other half is a map with many cities with goods tiles randomly placed between them. Players can collect the goods by traveling between the cities, sometimes by ship, sometimes by wagon when the right action spaces are activated. Players can build a trading post in in each of the various cities. These trading posts will be used to score at the end of the game. There is 1 additional board to mention. It is called a beneficial deeds board. By placing workers in the town hall action space players can effectively retire workers from the game and gain a benefit for doing so. There are 7 different deeds to send them to, each yielding coins to the player. This is the method to balance the number of workers available for a player to draw from their bag. It only takes a couple of turns to acquire more workers than can be drawn from the bag on a turn. Sending workers to the beneficial deeds board can be beneficial. There are 18 event tiles randomly stacked at the start of the game. One is turned over each turn with the effects happening at the end of the turn. Six of the tiles help players along. Nine of the tiles will end up costing players either money or goods tiles. There are 3 tiles that force players to draw a random worker out of their bag and return it to the supply on the main worker supply. This is not the most efficient method to balance the worker pool. Players do have that turn to make sure they have the coins or goods needed. To a certain extent players can even manage the workers in their bag that could get drawn and lost to the plague tile. Any worker not being used to activate an action space stays on the player board until the next round and cannot be drawn and lost. There is 1 more scoring element. They are called citizens. This is one part of the game where players will race to get something. Three citizens are located at various spots along the development track that is activated at the university. There is 1 citizen at the end of the boatman track and an additional 1 near the end of the knight track. Another 7 citizens are available to the player who fills the last remaining spot in each of the 7 areas on the beneficial deeds board. Players need to be aware of how close they are to completing any of these deeds. Their next play may be setting up someone else to grab one of the citizens. At the end of the game the number of citizens are added to the number of trading posts and multiplied by the distance covered on the development track. After 18 rounds the game is over and coins are worth 1 point each. There are 5 different goods available and they score from 1 to 5 points each. These points are added to the citizen, trading post points and the player with the most points wins. The scoring is well balanced between the different methods. Games always seem to be closely contested. If all this sounds complex, the actual game play is not. Players draw a handful of workers from their respective bags and then put them to use as effectively as possible. Like any good worker placement game, players can never come close to doing everything they need to do. Orleans adds the element of having to balance the number of workers of each type they have in their bag. In addition there are 20 different buildings available through the trader track. Each of them uses a different set of workers to give the player another action at their disposal. Orleans comes with a great set of boards, high quality components and a ton of replayability. 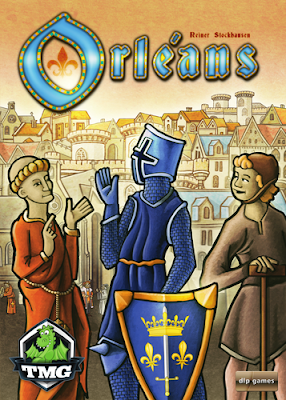 We have an open copy of Orleans available in our Demo Games Library for you come in and try. I really enjoyed this venue Houston and you can definitely find me here for more events. I didn't eat anything when on my recent visit, but those around me had truffle fries, pizza, and wings all seemed to enjoy. My experience with both card and board fortnite hack has changed as I've aged. As a child, I played Gin Rummy, 500 Rummy and Monopoly. In college, I learned to play Bridge which was a lot more challenging. When my children were small, I played Old Maid and simple board games. As a senior citizen, I play them all, but always with different friends or family members. And each game at each age has been different but (almost) always enjoyable. My experience with both card and board profile has changed as I've aged. As a child, I played Gin Rummy, 500 Rummy and Monopoly. In college, I learned to play Bridge which was a lot more challenging. When my children were small, I played Old Maid and simple board games. As a senior citizen, I play them all, but always with different friends or family members. And each game at each age has been different but (almost) always enjoyable.